Morocco – Our Classic Big Reconnect Sleepover Retreat! 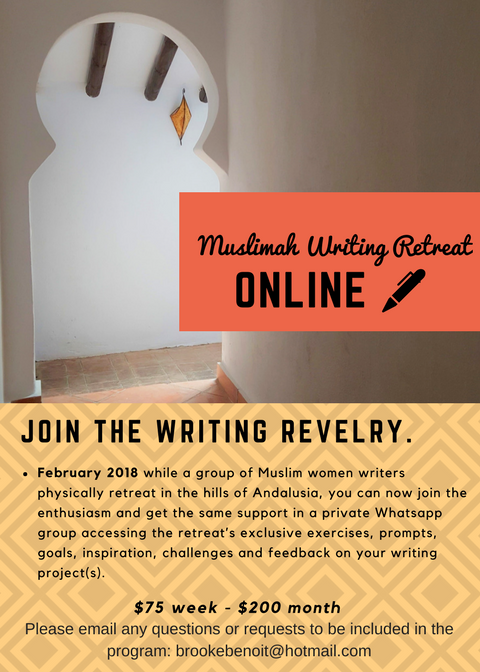 This online retreat will work on a wide variety of projects, including but not limited to creative writing, memoir, website content or anything else you need a push towards your keyboard to either begin or finish. Working in a group with a skilled leader- this is how to reach your writing goals. First week begins Thursday February 1st. A preparation sheet will be sent to you up to one week prior to your retreat to help you best use your writing time. At the end of your retreat you will receive a compilation of all your retreat exercises, prompts, etc. “My first encounter with Brooke Benoit was when the Islamic advisor for SISTERS tore up an article I had written. Brooke asked me to rewrite it, but after staring at the screen for a couple of days, I couldn’t find a way to stay true to my own voice while addressing the issues brought up by the advisor. When I voiced my reservations to Brooke, what I expected was that she would write back and tell me if I was unable to fix the piece, then it would be scrapped. I was quite confident that would be her response; after all, her priority as the editor had to be that she keep the pace of articles flowing to meet deadlines, and surely advising individual writers would only set her back. I understood completely and was fully expecting her to give me a quick, ‘better luck next time.’ But Brooke didn’t do that at all. Instead, she took the time to more fully explain the advisor’s criticisms, his reservations, and even gave me ideas as to how to work the article so that I could stay true to myself while addressing the points the advisor had made. With Brooke as my coach, I was able to revise an otherwise dead article and send it back to her within just days. It was my first experience with her, and with it, I knew that I had found a mentor. The first five writers to sign up will receive a free one-on-one online working session with host Brooke Benoit (regularly $50 USD).